Now that I finally finished my series on the bike trip, I think I need to write a brief post on where I am and what I am doing. For years, I said I would never end up in Los Angeles. Now, I live in the lecherous heart of a city defined by people who wear masks for a living. I have been in Hollywood for a month and a half, and already, I see Hollywood’s exported self-image for what it is: a facade. Los Angeles lays claim to the largest population of people living on the streets in the country. Hollywood’s international fame is not immune to the presence of folks without houses. For as many names of dead, living, and fictional celebrities imprinted into stars in the sidewalks, there is an equivalent amount of people living on these same walkways. Furthermore, making the gentrification complete, the average annual income of the people living in my neighborhood is $27,000. They make up the servant class to the opulent movie industry. They clean the studios and homes of those who work in them. Within their poverty, drugs and gangs rose to direct this community. What am I doing here? Right now, not enough. this house is DOOR (Discovering Opportunities for Outreach and Reflection). On Monday mornings, my housemates and I awake to clean the whole house. We proceed to the grocery store to buy our food for the week. Mondays are Community Days. We work together to accomplish the tasks necessary for maintaining the well-being of our community. We take time out of our day to connect. Prayer, discussion, book study, and open, honest reflection about our time here come on Mondays when we gather with our City Director Matthew Schmitt. These days mean a lot to me. I love them because I love my housemates, even though I might not tell them enough. Additionally, these days possess the messiness of life in a concentrated way. Community Days hold the greatest potential for Love and conflict. We cannot run from each other on these days. Our vulnerability exposes and opens us; our need for cooperation grinds us against each other. Beautiful. Tuesday through Friday, I arrive at Social Services of Blessed Sacrament at 6:30 a.m. to work in the drop-in center there. At Blessed Sac, we provide numerous different services. Most days, we serve breakfast and lunch. We provide showers, clothes, a nurse, haircuts, and AA meetings depending on the day. People trying to get into a transitional shelter need sheets of paper called “Homeless Verifications”, and we offer those. Folks come to us to receive reduced-fee vouchers for IDs and bus tokens to get to there appointments. If they miss lunch, they can get a sack lunch. Our ultimate goal is to end homelessness in Hollywood. Consequently, we provide case management in order to help people locate and secure housing. Basically, work at Blessed Sac is the best part of my week. I wake up wanting to go to work. I miss it over the weekend. For some time, I felt called toward social work, toward working with the people shoved off the sidewalks after they have been evicted from their homes. I flirted with pastoral ministry, but every time the opportunity arose, something prevented me from entering ministry. This work showed me why. This is where I belong. As I write, my life feels consumed with Love thanks to working with those who come into the center. Beautiful. At least one day a week, I help prepare dinner for my whole house. 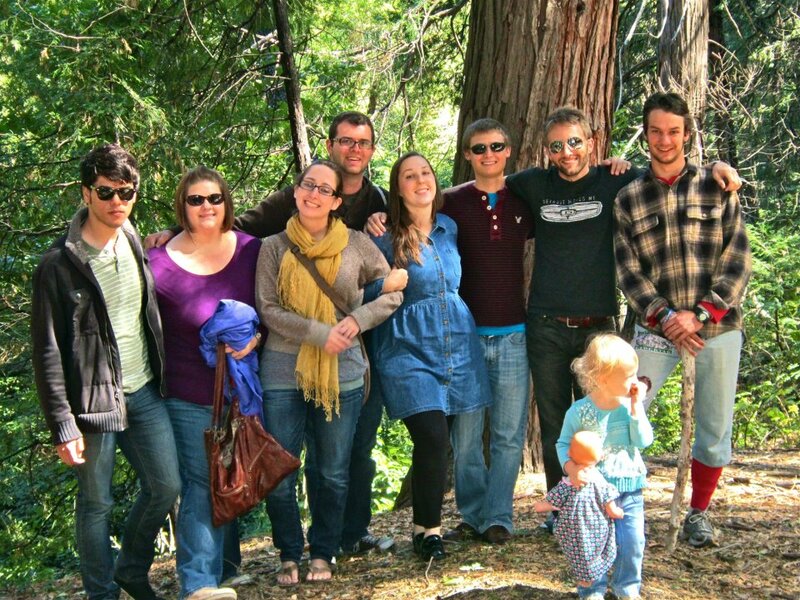 This experience may be one of the greatest reasons for living in intentional community. Preparing food for others shows Love in a powerful way. When I lived on my own, getting motivated to cook healthy, delicious food proved nearly impossible. Of course, when I only have to cook once a week, it enables me to put more effort and thought into that meal. This means every meal comes out tasting great. We eat like kings! Beautiful. After I come home from work, I help run a community center out of our house two days a week. We essentially live in three houses. The front house functions as a community center while we do all the living in the back two houses. Out of that community center, we open three days a week to provide a safe place for kids in the neighborhood to meet, get help with their homework, play games, learn new skills, build relationships, feel loved, and just have fun. So far, this piece of my life is jumbled. Very little continuity carries over from one year of volunteers to the next. Therefore, we recreate this entire part of our communal life each year. This amazing opportunity grants us the ability to be caring adults in the lives of kids. Whether youth have loving families or not, the approval and encouragement from young adults can mean more than anyone may ever know. I find this part of my life both exciting and fulfilling. Beautiful. Well, now you know what I am doing. This is my life for now. I hope it continues to grow and evolve as I do. It is proving very fulfilling, to say the least. I hope you call, e-mail, or visit me while I am here. Moreover, I hope you turn to your own community and imagine how you can make your life more intentionally geared toward building relationships with those around you. Look to be in solidarity with the ignored and shoved aside. Love with reckless abandon. Create a world that is beautiful. Gallery | This entry was posted in Community, Gentrification, Love, Personal, Reflection and tagged Hollywood, Intentional community, Los Angeles, Love. Bookmark the permalink. 4 Responses to Dear ben adam, What Are You Doing? I am currently finding myself in a place of stress and discontent. Community: one shedding light on a different perspective that another has been too bogged down to see. Beautiful. Thanks for filling in the picture,.Ben. The folks at LACW are looking forward to meeting you!